I would highly recommend this app for anyone looking for a study tool. The way the questions are broken down into subject matter allows you to see which areas need work and which areas you don’t need to spend a lot of time on. I have an up coming exam, will see how good this APP is after the exam. So far I feel good about the material I am reviewing. Downloaded app today to iPad Pro. Tried to open free trial of upper gi exam and the app crashes every time. I have found that this is the most amazing app ever. I really enjoy this app in morning before work and late nights every day. I would recommend this app if you just don't have the time to open a book. More content regarding pharm would be nice, since I’m paying I’d expect at least that. Overall app has good content and has decent features like being able to mark your confidence level but I feel the topics could align better with the book content since they write them both. I love this app it has so many questions and the category break down is awesome! The only thing I would recommend for this app as well as the NCLEX mastery app, is the ability to make your own quizzes. Also it’s a little pricey, hoping it’s worth it- so far it is. I highly recommend this if you are toward the end of nursing school or about to take the NCLEX. Having just taken the NCLEX this week (and passed) can say with confidence that this app was the best supplement and mobile study tool for me. 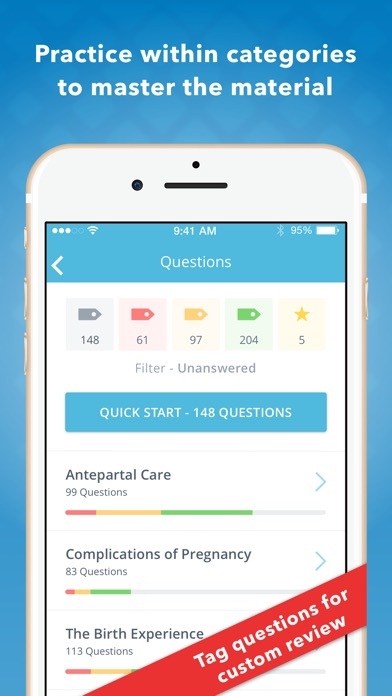 The interface was very user friendly and the style of questions were somewhat similar to the NCLEX in my opinion. But they still were more challenging than the Master RN app. I still used UWorld primarily, but I saved that for home so I could buckle down and really understand the rationales. 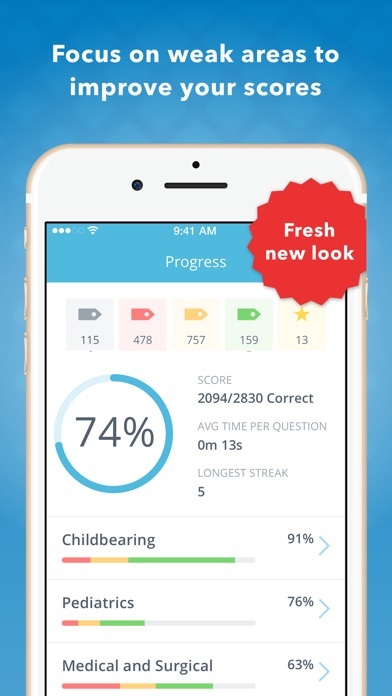 This app I used when I was killing time while running errands or waiting for appointments. My only complaint are the short rationales - I would prefer something a little more detailed. Sometimes the rationales are a paragraph long rather than spaced out. I would also prefer if the rationales were instead written next to each answers. The quality and quantity of knowledge contained in this app astounds me. I am a current nursing student, and the questions presented are exactly like the questions I take on my exams. They have definitely helped me perform better on my tests. Each question is followed with a very in-depth and detailed scientific rationale explanation about why a certain answer is correct/incorrect, and this helps me retain and reinforce important nursing facts and concepts. Now, I feel more comfortable and confident approaching NCLEX style questions. They're challenging questions, which force me to "think like a nurse." Ten stars for the quality of material! UPDATED: I continue to LOVE this app for its convenience and on-the-go studying! I do at least 20 questions daily, and I have maintained an 88 average in my nursing classes. I know that this app has helped me achieve that grade and will help me pass my NCLEX with ease, which is fast approaching.